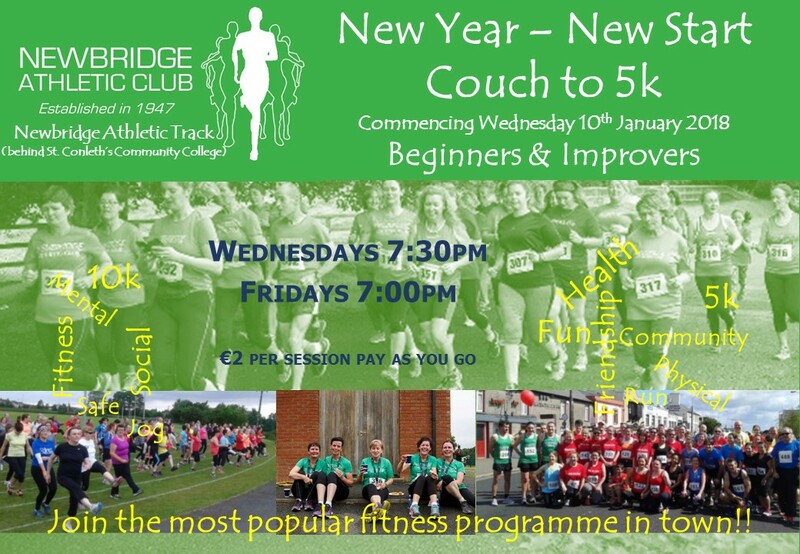 Newbridge AC Fit for Life is a vibrant and still growing part of the club. Started in January 2015, this section of the club caters for all levels of runners right from absolute beginners. It’s all about making fitness a fun part of your life and there is a great sense of friendship and community within the group. Directions: The group training sessions take place at Newbridge AC track on the Station Road (behind St Conleth’s Community School) twice a week. There is parking available in the car park behind the school. Please do not park at the track as with current construction works this can be a hazard to those entering or leaving on foot. Training times: Wednesday night at 7:30 and Friday nights at 7:00. Please try to arrive a little early so you can warm up before the session! Note: We have carried out sessions in sideways rain & hailstones so unless there is an extraordinary event, you don’t need to ask….training will be happening!! Comfortable layers….you will get warm! On arrival at the clubhouse members sign in at the desk and get started gently warming up the legs with a few laps walking. Once most of the group has gathered a volunteer gets everyone together for a more dynamic warm up. Once this is done the groups separate to begin their training session for the night. On each night there is usually a mix of training going on with some groups staying on the track to work on building up their running distance or doing some speed work under the supervision of a leader. Other groups take to the roads for either a casual run or some kind of training to build speed and endurance such as hill-work or tempo runs. Once the training session is over a volunteer takes the group through some light strength and conditioning work and/or some stretching. Our goal race for 2018 will be announced soon. We also try to take part in Naas Parkrun on the first Saturday of each month. If you have not been part of the group before at any stage then please print off the below Health Screening Questionnaire and bring it along to your first session.